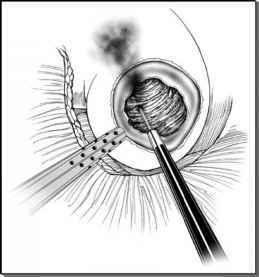 Renal hilar clamping is not necessary for every laparoscopic partial nephrectomy. Several centers have reported wedge-resection without hilar clamping for excision of small exophytic tumors with minimal parenchymal extension (6-8). FIGURE9 ■ Three ports are needed during retroperitoneal laparoscopic partial nephrectomy. The initial port is at the tip of the 12th rib. The posterior port is at the junction of the costal margin and the paraspinal muscle. The anterior port is 3-5 cm cephalad to anterior superior iliac spine. 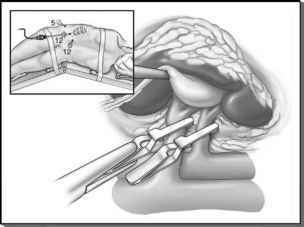 FIGURE 10 ■ During retroperitoneal laparoscopic partial nephrec-tomy laparoscopic bulldog clamps are used to clamp the renal artery and vein separately. Intraoperative illustration of the renal artery and vein individually dissected and controlled. Although several novel techniques for achieving laparoscopic renal hypothermia have been investigated in the laboratory, a simple and reliable method has not been established yet. The most effective method to control significant segmental parenchymal vessels remains the application of hemostatic parenchymal sutures duplicating the open surgical technique. Potent bioadhesives may become an effective method for obtaining renal parenchymal hemostasis in the future.